Say what? After what seems like months and months of "it'll be here before the end of the year", there seems to be official confirmation that Visual Studio 2008 will not be launched until 2008. February 27th to be exact. 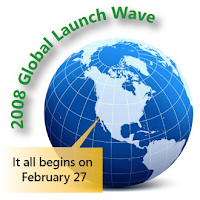 In what's being called the "Global Launch Wave", Microsoft will launch Visual Studio 2008, Windows Server 2008, and SQL Server 2008 at the same time in February at what is sure to be an over the top party in Los Angeles (they had to use that PDC credit somehow). There are even widgets being supplied for your website and for Vista to help you keep track of the countdown. Now, apparently I am very late in noticing this announcement since the news was originally published in early July. I think that I've seen Microsoft insiders still reference a late 2007 Visual Studio release since July, but clearly I must be crazy. That or they are referencing a potential November RTM release for MSDN and Technet subscribers (a la Vista). Either way, the date is very official and you can put off plans of working with retail VS 2008 'til at least February. Am I the only one who missed this? well I missed this post too. However I do think I read somewhere that VS2008 is still slated for 2007 end-o-year launch. Maybe like Vista, those with license agreements will get vs08 via download (licensing or technet sites) in November/December, but Retail purchase will be in Feb 2008? That's a great link. I think that makes it clear what's going on (and what I speculated in my post): VS 2008 will be released near the end of this year, but it will be launched early next year. That won't make a lot of difference to devs with MSDN and Technet access, but if you're relying on retail purchases to get VS, you're out of luck (I think). I am attending the Dev Connections conference in Vegas in November and it has been said that attendees will be receiving a copy of VS 2008 -- so I am assuming it's RTM. Good enough for me. That's news to me! Thanks for the post, I completely missed the change in schedule. The official triple release of VS2008, SQL Server 2008 and Windows Server 2008 is in February but that is just the media event. It's like when a retail store has it's "grand opening" a few months after opening. If it was the first day of business, no one would know of them and so no one would come. You are right. I am wrong in light of the new information. But, this represents a change in Microsoft's public plans. Originally, it was expected that MS would make VS 2008 RTM available to channel partners and MSDN subscribers by November and then launch retail availability in February. Making VS 2008 generally available now is definitely great news and bit different than the expected plan. Either way, enjoy the new VS and watch for more details in the near future.